Formerly a symbol of immense urban waste, the Fresh Kills Landfill is being transformed into an enormous parkland destined to exemplify the values of ecological restoration and environmental sustainability. 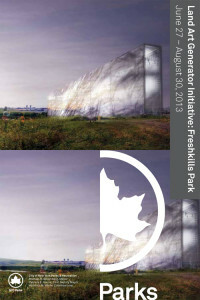 In partnership with the New York City Department of Parks & Recreation, the Land Art Generator Initiative held an ideas competition for a site-specific public artwork designed to operate as a source of clean energy for the city utility grid, using Freshkills Park as the design site. This volume features many of the top submissions to that open call, each with the capacity to power hundreds of homes. The Land Art Generator Initiative creates sustainable design solutions that integrate art and technology into renewable energy infrastructure around the world. Regenerative Infrastructures draws a much needed connection between the two critical issues of sustainable development—energy generation and waste management—highlighting solutions that address both problems at once, thereby creating economically beneficial hybrid utility installations.